"Electric knife sharpeners, Chefs Choice, Commercial Knife Sharpeners, Serrated Blade Sharpener, clearance sale, #CHEFS, new, lowest price, best, tested, review, rated, pro, cutlery, knife, new, diamond hone sharpener, diamond hone, diamond honing, 100, 110, 120, 320, 310, 325, 2000, 500, parts, 410, 316, 412, 130, 416, 460, 450, 470, 430, 480, 483, 1520, 464, 489, 210, 220, 210, 220, 1520, 15/20, 300, 2100, hybrid, diamond hone, diamond sharpener, asian knife sharpener, parts, sale, lowest prices, bonus, bonus offer, chefs choice best price, chefs choice lowest price, fix, use, free shipping, knife sharpener Chef Choice, buy Electric knife sharpeners, where to buy Chefs Choice"
Chef's Choice Electric Sharpeners are used by Culinary Schools, Restaurants and Hotels! 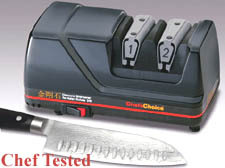 Chef's Choice Diamond Hone Knife Sharpeners - use the best in your kitchen! Sharpeners on sale now! 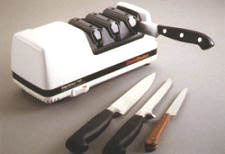 After extensive testing by our Chefs with many sharpeners and many knives, we have determined that Chefs Choice brand electric sharpeners are excellent. You will be amazed at how fast and easy it is to use these machines. They operate very quietly and with just a few stroked will create a razor sharp edge on any quality knife in a few seconds. There is one area of savings that many people don't realize and that is the cost of safety. Everyone knows that dull knives cause injury by having to use excessive force on the item being cut. But that can be avoided by keeping the right edge on a knife. "In a matter of seconds, I have professionally sharpened each knife with a razor-edge and I am ready to cook! By providing sharp knives to our kitchen staff, we reduce accidents caused by using our knives, which dull quickly between sharpening service". Why not eliminate the need for knife sharpening services? Time is money - These machines save you money! Free Shipping on all Chef's Choice Electric Sharpeners over $99.00! Cont. USA only. Chef shows you how to easily sharpen your knives! These sharpeners are all in stock with fast FREE SHIPPING (over $99.00 in Cont. USA)! All the Chefs Choice models are similar. Order now, get a free knife! Please email us any questions! Pro Chefs pick our hand forged knives! Sets or Cleavers & Chef Knives. John Boos NSF Maple Butcher Blocks and Cutting Boards! The new model 320 professional two stage Diamond Hone electric knife sharpener incorporates conical 100% diamond coated disks in Stage 1 and a revolutionary stropping/polishing disk in Stage 2, to create, in just seconds, an edge of unprecedented sharpness and durability on fine edge (straight edge) and serrated knives. Enjoy this new stropping/polishing technology that resharpens with less metal removal than conventional means, even less than sharpening steels. High precision angle guides helps to virtually eliminate guesswork. Two year limited warranty. Your choice of color, White, Platiunum or Brushed Metal housing. Made in U.S.A., 120 volts. Chef Notes: Perfect for every kitchen, very compact. This sharpener has a unique stropping and polishing stage for extra sharpness. If you want a great high power compact electric sharpener that removes very little metal, get this one. Click Here For 100 lb. to 600 lb. Butcher Blocks! Chefs dream kitchens start here. 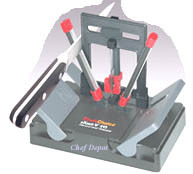 Introducing Chef's Choice Commercial Diamond Hone Knife Sharpener 2000. This 2 stage commercial electric knife sharpener uses 100% diamond abrasives in stage 1 and ultra-fine honing disks in stage 2 to sharpen all kitchen knives (including serrated, fillet and butcher settings) to hair-splitting sharpness in seconds. Perfect as an alternative to outside knife sharpening services, the 2000 will never detemper the knife blade and features a powerful motor, precision angle guides and a sturdy compact design. The rugged replaceable sharpening module (included) easily detaches for cleaning in sink or dishwasher. Recommended for Sharpening Services, Pro Chefs and large Commercial Kitchens. One year limited warranty. The color is gray, made in U.S.A., 120 Volts. Order this sharpener and receive FREE SHIPPING (Cont. USA only) and a FREE 7 in. Forged Hollow Edge Santoku Knife, with purchase of this Chefs Choice Model 1520 Angle Select Electric Knife Sharpener! Features a sharp stainless steel blade with a black poly handle! 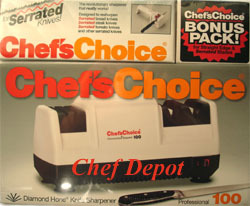 Chef's Choice electric sharpeners are preferred by Chefs and professional Cooks! Limited Time Sale! 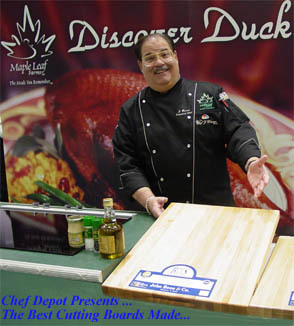 Click Here For Solid Maple Butcher Block Islands! Presenting the Chef's Choice new Model 120 Diamond Hone Knife Sharpener. This electric knife sharpener incorporates 100% diamond abrasive disks in stage 1 and 2 and a revolutionary flexible polymer stropping disks in stage 3 to sharpen and polish straight edge and serrated edge kitchen knives in seconds. It is safe for all alloys and never detempers. The user friendly knife sharpening system features a powerful motor, patented 2 stage sharpening, precision angle guides and built in abrasive cleaning mechanism. Perfect for every household kitchen. Choose from several colors or a solid metal unit below. Made in U.S.A., 120 volts. Three Year limited Warranty. Chef Notes: Perfect for every household or pro kitchen. A great choice for serious cooks or beginning Chefs. Cooks Illustrated rates this as a great unit! The classic style Chefs Choice Diamond Hone Knife Sharpener. This electric knife sharpener incorporates 100% diamond abrasive disks in stage 1 and 2 revolutionary flexible polymer stropping disks in stage 3 to sharpen and polish straight edge kitchen knives and pocket knives to razor like sharpness in seconds. It is safe for all alloys and never detempers. The user friendly knife sharpening system features a powerful motor, patented 3 stage sharpening, precision angle guides and a built in abrasive cleaning mechanism. Choose from White, Black or Chrome below. Made in U.S.A., 120 volts. 2 year limited Warranty. Chef Notes: The sharpener is on price match sale for for a limited time. Perfect for every household kitchen. A great choice for kitchen cutlery and pocket knives. Click here for Manual Sharpeners! This is the professional Chefs choice for a perforated offset spatula. It is the one preferred by more Chefs than any other. It is made from thick but flexible stainless steel with a non slip, comfortable and unbreakable poly handle. NSF approved. Aprox 8 in. x 3 in. blade. Our new Chrome Chefs Choice Diamond Hone Knife Sharpener will look great in your retro or modern kitchen. This electric knife sharpener incorporates 100% diamond abrasive disks in stage 1 and 2 revolutionary flexible polymer stropping disks in stage 3 to sharpen and polish straight edge kitchen knives and pocket knives, producing hair splitting sharpness very quickly. It is safe for all alloys and never detempers. The user friendly knife sharpening system features a powerful motor, patented 3stage sharpening, precision angle guides and a built in abrasive cleaning mechanism. Chef Notes: We dig it, you will too. A great choice for kitchen cutlery and pocket knives! Wow, Chef's Choice Diamond sharpener for Asian Knives...This new sharpener is designed to put a factory sharp, precision edge on all contemporary Asian style knives, Chinese style cleavers and the thinner, traditional single bevel or double bevel style Japanese blades and sushi knives. Incorporating 100% diamond abrasives in both Stage 1 and 2, the Model 316 hones and polishes each side of the knife blade separately at 15 degrees. This feature allows the user flexibility and the sharpest possible edge on all contemporary double bevel Asian style blades AND traditional Japanese single bevel knives. High precision elastomeric angle guides eliminate all guesswork. Safe for high quality knife brands. Two year limited warranty. Assembled in the U.S.A. UL/ETL and Canadian Approval. Order this sharpener and receive a free paring knife with a lifetime warranty! Chef Notes: You can now quickly keep your sushi knives sharp. A great choice for all sushi knives! Our exclusive Red Chef's Choice Diamond Hone Knife Sharpener will look great in your colorful kitchen. This electric knife sharpener incorporates 100% diamond abrasive disks in stage 1 and 2 revolutionary flexible polymer stropping disks in stage 3 to sharpen and polish straight edge kitchen knives and pocket knives to a very sharp edge in only a few seconds. It is safe for all alloys and never detempers. The user friendly knife sharpening system features a powerful motor, patented 3-stage sharpening, precision angle guides and a built in abrasive cleaning mechanism. Chef Notes: Cool bright red color. Click Here For Breakfast Bar Islands! Patented 2 stage electric knife sharpener uses orbiting 100% diamond abrasives and foolproof magnetic guides to give knives sharper, longer lasting edges. Safe for quality knives. Sharpens full blade edge of kitchen, pocket knives, hunting and fishing knives. 1 year limited warranty. Color is White. Made in U.S.A., 120 volts. This sharpener has a unique stropping and polishing stage for extra sharpness. If you want a good compact electric sharpener that removes very little metal, get this one! BONUS: FREE PARING KNIFE, HIGH QUALITY! The new soft sided Culinary Tool Box is perfect for Culinary Arts students and Culinary Schools! Color is black. Made to hold 12-25 pieces of cutlery and garnishing tools. This case is very durable and has a removable knife tray and another zippered section for pastry brush, tongs, spatulas, thermometers and more. This great case has a sharp modern look and feel and it's made to last! More Knife Cases! Click Here! Click Here For Stainless Steel Chef Islands & Tables! Chef'sChoice Diamond Hone Serrated Sharpener. The revolutionary manual knife sharpener for serrated and "never-need-sharpening" knives! Precision guides and 100% diamond abrasives turn dull serrated teeth into ultra-sharp "micro-blades". Knives glide effortlessly through food for clean, smooth cuts. Easy to use right- or left-handed. Chefs Note: A nice little stocking stuffer. We like this for a quick fix for dull steak knives! Made in the U.S.A.! Chef's Choice new Steel Pro is simple to use! For those who prefer a steeled edge, the SteelPro is a revolutionary breakthrough. It delivers an edge that is far superior to conventional steeled edges. Incorporating super-hardened, non-abrasive miniature steels and precision angle guides, the SteelPro maintains your original knife geometry, creating microscopic serrations that not only cut better, but last longer so you don't have to steel as often. The SteelPro is safer & easier & less intimidating to use than conventional steels. The design of the SteelPro ensures that no fingers are exposed to the knife edge and the precise angle guides make the process a snap. Safe for most all quality knives. Hand washable. Made in U.S.A. One year limited warranty! Our Madagascar Vanilla Beans are the highest quality available. They are highly prized by the Pastry Chefs who use them for their wonderful flavor and freshness. They are used extensively by Pastry Chefs and Gourmet Cooks around the world. Congratulations to Team USA, finishing 1st Place in the 2002 World Pastry Chef Championship using our vanilla beans! These Madagascar Bourbon Vanilla Beans (the best variety) are prized for their fragrant strong flavor. Our vanilla beans are very large ( 6 in. - 9 in. long), soft, plump and fresh. Please call us for large quantity discounts. Our very Large Gourmet Madagascar Vanilla Beans, extract, paste and powder (click here) are 100% Completely Organic Grown and PAREVE ~ Kosher certified! Copper Pots ~ Click Here ! Our new Infrared Laser Thermometer is a great value. 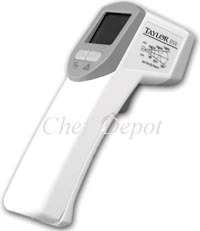 This professional laser thermometer with advanced temperature processing meets new HACCP requirements. Infrared thermometer with a laser sight and backlit LCD display. User friendly reads surface temperatures in half a second. Rugged housing with recessed optics with scan and hold features. F/C selectable. - 4 degrees to 605 F or -20 to 320 C. Accuracy +/- 2 F over the HACCP critical range of 32 to 122 F. Resolution 0.1 F or 0.1 C. Emissivity preset at 0.95. 8:1 optics. Auto off feature. Includes 9-volt battery and instructions. Chefs Note: Our Chefs and a health dept. 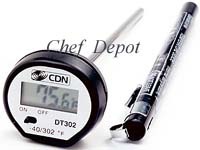 inspector tossed these units around for many weeks and tested it on many foods, it's a great thermometer! Order a Butcher Block Table for your Spouse! Click here! 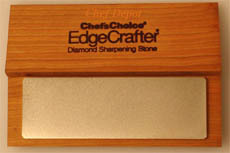 Chef Choice Sharpening Stones and more manual diamond stones are here. Our new John Boos Square Walnut Block features 4 bun style legs, 9 in. x 9 in. or 12 in. x 12 in. x 1.5 in. inches thick! Perfect for picnics, preparation or serving cheese & holiday appetizers! Oiling it with mystery oil, will keep it looking new for many years of use! What a great gift idea! Order 2 or more and get free shipping (only in cont. USA). Receive our exclusive John Boos Mystery Oil for Free with any John Boos Cuttingboard purchase (you must click add to cart, see free offer below). Click here for Chefs Favorite Spice Blends! The Chefs Choice Pronto Manual Diamond Hone Knife Sharpener 464 is easy to use, quiet and fast. This knife sharpener puts an extremely sharp edge and long lasting edge with lots of bite on straight edge and serrated knives. This two stage sharpener features 100 percent diamond abrasives and precise bevel angle control. The Chefs Choice Pronto applies an extremely sharp double bevel edge with microscopic teeth along the cutting edge. These tiny teeth provide the bite on the edge and work to engage and stabilize the food for effortless cutting. Chefs Choice Pronto Manual Diamond Hone Knife Sharpener, Made in USA. Easy, foolproof simple sharpening. Left or right handed use. Warranty: 1 year. Click Here - Chef Tested Cookware Sets! Great Holiday Gifts! The new Chef's Choice exact-V Diamond Hone Knife Sharpener! This "V-type" manual sharpener uniquely combines a precision spring-loaded angle guide, adjustable sharpening force, two-stage dual angle sharpening and 100% diamond abrasives to quickly pro-duce a durable and razor-sharp double bevel edge on a wide variety of straight-edge kitchen, sport and pocket knives. The angle guides can be removed for conventional V-type sharpening. The base converts to a compact, lightweight and portable storage box that houses the sharpening rods and angle guide. No lubrication required. Made in the USA. One year limited warranty. Chef Notes: Simple and easy to use. This is a great sharpener for every Chefs Tool Box or Fishing tackle box! Popular Mechanics gave it the thumbs up. Great gift idea! Click the page links and green arrow on the right for more Chef's Choice!